You may not know this about me, but I collect crystals and stones. Some are used for different reasons in the Wiccan community, and some are great for using in Reiki and other forms of therapy. 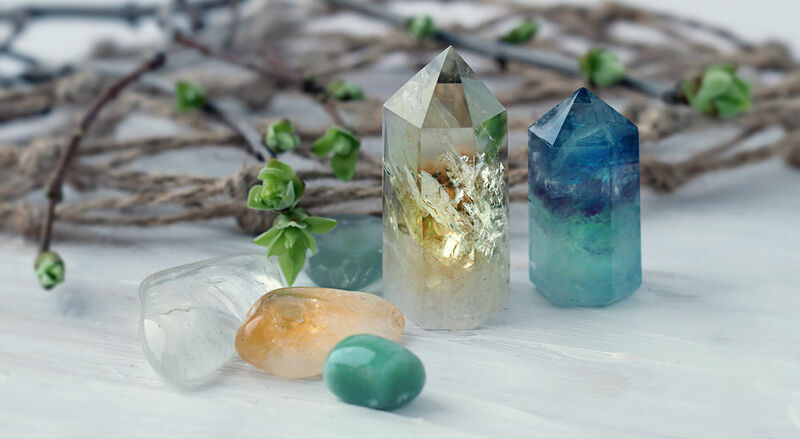 It’s completely up to you whether you believe in the power of crystals, but personally, I feel as though they’re a great thing to have as both decoration and for strength when you need it. I have quite a collection right now, so I figured I’d write a post about some crystals and their meanings for anyone who is interested. If I’m reading tarot, I’ll sometimes place crystals near me to provide a decent and accurate reading, or I’ll place a crystal on my bedside table in order to gather strength or courage (depending on the stone). If you believe in the power of crystals and would like to start a collection, the following are great to buy due to their price and meaning. The majority of the following stones can be found online with sites such as eBay, or at market stalls such as the Christmas Markets in Manchester, where I’ve found many of my stones in the past. Agate is usually found in brown and gold tones. However, you can find Agate in pinks and blues. Agate is related to mental health and matters of the mind. This is why it is used in spells relating to mental clarity and truth. It is also thought to aid healing of the mind from ailments such as depression and anxiety. Noted for its purple tones, Amethyst stones are a form of quartz, and is my favourite crystal! It’s also my birthstone and is related to water and water signs such as Pisces and Aquarius. It is also thought that Amethyst is great for healing depression and cleansing the mind of sadness and stress. This crystal is also known as Heliotrope and is usually a green but speckled stone with gold and red tones. Relating to fire and blood, the bloodstone is used in issues dealing with infertility and menstrual cycles in women. Hematite is metallic in colour and freaks me out a little because it looks like it fell off of a T1000 Terminator. In any case, it’s used in rituals to do with pre-birth and blood disorders by the Wiccan community. However, it’s also thought that carrying this gem will bring strength and courage willpower alongside confidence. Jade is bright and green and can come in a range of deep and light tones. It can also be found in pink and grey tones, though these stones are rare. Despite its links to love and innocence, the Jade stone is more associated with matters inside of our bodies and promotes healthy organs. Otherwise known as Egyptian marble, the Jasper stone is brown and red and is strongly connected to Earth elements. In treatments such as Reiki, it is used to heal cancer and promote healthy cell growth. For Wiccans, it’s usually used in grounding spells. Linked to female sexuality and childbirth, the moonstone is linked to goddesses such as Diana and Hecate. They are also used to help lift fogged brains and raise intuition levels in women. In Reiki, the Rose Quartz is used as the heart chakra, and in other mythologies, the stone is associated with love and relationships. It is also thought that carrying a Rose Quarts will mend a broken heart. If you’re into charging your crystals, charge Rose Quartz’ under a full moon, as they can soon lose their colour if left under direct sunlight. This specific stone crops up in Practical Magic, and is used to promote courage, confidence and protection. Heads up btw Practical Magic is amazing and everyone should watch it. The stone also promotes health and strong energy.